Foundation for Information Society (INFOTA) has been operating as a research institute and knowledge centre since 1998. 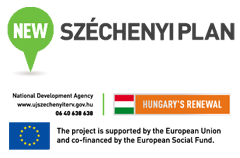 Its activity covers R&D, innovation, application development and consultancy tasks for industrial, commercial and service sector, state organisations and municipalities in Hungary and abroad. Its interest area has got a wide range: information society, social networks and multicultural issues, information management, knowledge management, eLearning, educational games, simulation and optimisation of value production business processes, ebusiness and e-services, data and text mining, economy modelling, trend analysis, decision support, digitisation and information retrieval, data protection and information freedom, IT safety and security, tourism and heritage protection etc. Related to the above, it makes software development and implements mobile and cloud based systems. The R+D+I projects are made partly on the basis of orders by companies and institutions, partly in the frameworks of Hungarian or EU project calls, in order to further develop achievements as well as to create new products. ITA has been publishing the research results in a periodical since 2001. In the middle of 2007, the staff was completed by that of the Department of Information and Knowledge Management of Budapest University of Technology and Economics and they have been jointly continuing the basic and applied researches as well as the national and international co-operations started at the University. In relation to the information society, the staff of the Department has had a determining role in the territories of researches, knowledge development, education, skill and information enhancement. As professional consultancy partners, they have contributed to determine strategic directions of R+D activities, to share foreign professional experiences and relations and to support the efforts of INFOTA. INFOTA is an accredited adult training institution. Beside trainings established on the basis of individual requests, it offers courses from rapid, one or two day long instructions to professional several month long educations. Beyond teaching material development, INFOTA can also undertake the eLearning adaptation of their partners’ inner courses by their own developed, practice oriented, video based eTeacher system. Meanwhile, the staff is permanently teaching in national and international higher education institutions and they frequently take part in the organisation of Hungarian and foreign scientific conferences.